Folk Games | Visit Russia in Arizona! We invite all our guests to get familiar with some traditional Russian folk game and participate in competitions. The winners will get prizes and will be announced. 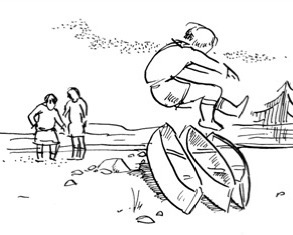 Gorodki competition will be held as a simple version of the game with the simplified rules. The competition will be held in different age groups. The players with the highest scores will win prizes. Klassiki (Russian: Классики, classes. 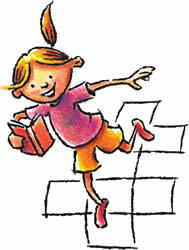 English: Hopscotch) Classiki is a popular children’s game which can be played with several players or alone. 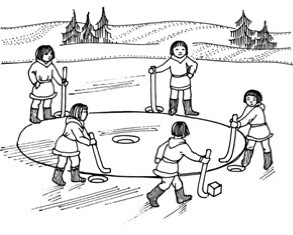 This game is popular among the girls of the school age. The rules of the game are very simple. 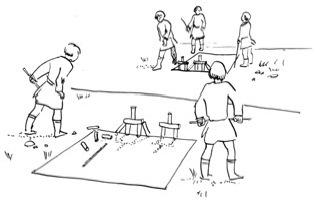 The first player tosses the marker into the first square. The marker must land completely within the designated square, without touching a line or bouncing out. The player then hops through the course, and picks up the marker on the way backs. Single squares must be hopped on one foot. For the first single square, either foot may be used. Side by side squares are straddled, with the left foot landing in the left square, and the right foot landing in the right square. Upon successfully completing the sequence, the player continues the turn by tossing the marker into square number two, and repeating the pattern. If, while hopping through the court in either direction, the player steps on a line, misses a square, or loses balance, the turn ends. Players begin their turns where they last left off. The first player to complete one course for every numbered square on the court wins the game. Generations of children have enjoyed the fitness, endurance and co-ordination benefits of Klassiki. Arkan(Lasso) Lassos are part of North of Siberian culture where the throwing of a lasso, for example, on deer horns was the important professional skill for nationalities like Chukchi, Koryak, Ukageer and Itelmen. 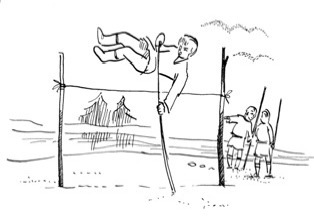 Traditional games or games-competitions would have throwing of a lasso on a trochee in competitive conditions (who will make exact throws more), a throwing of a lasso on players (“deers”) running on a play platform. 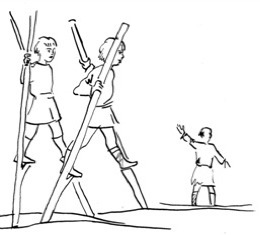 Children games would have throwing of the truncated lasso on socks of sledge, on branches of trees, on the little stakes specially hammered into the ground, on suspended on a cord block, etc. We will have some more games and competitions and different activities for kids and their parents.